I’ve made some real, visible progress! 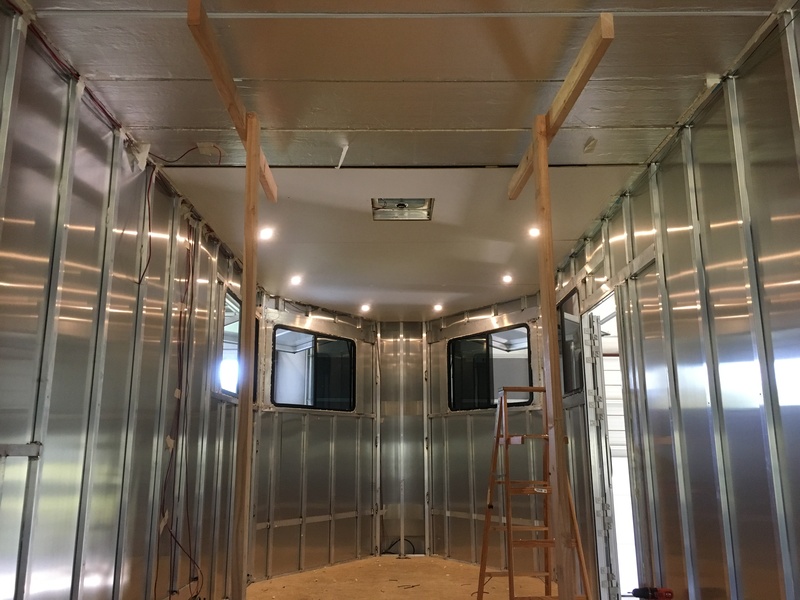 Took down the ceiling panels, adding 2″ of additional insulation, cut out holes for the lights, ran the wiring, put the ceiling panels back up and wired up the lights. Hooked it all up to a temporary battery and flicked the switch – first time, no issues, all the lights turned on! It was a beautiful, gratifying moment. Almost all of last week was spent doing computer work so I had basically no free time to work on the RV. It’s great when the work comes in, helps the checkbook and all, but it would be nice to flatten out the peaks and valleys a bit. Taking the ceiling panels down wasn’t too terribly difficult, gravity really helps with that process. Installing the additional insulation was certainly a chore, but so long as the cuts are somewhat precise, a snug fit will keep them in place. Adding the wiring for the lights is easy, I’m very familiar with low-voltage wiring, so no problems there. Getting the panels back up into place though, that was really no fun at all. After a few minutes standing on a ladder holding an 8’x4′ panel trying to wedge it into the previously-used divider moulding (similar to these), it became obvious very quickly that I needed to build some kind of system to hold the panels up near the ceiling while I messed around with getting them up the last few inches. I built assistants with arms that would never tire and they never even complained about it. The miter saw I picked up last month really came in handy on this project. I went through a couple of design plans in my head before landing on something pretty simple, and it worked perfectly for the duration of the project. The divider moulding proved to be very difficult to re-use. Trying to wedge the board into it, then bend the board enough to wedge it into the other side just wasn’t working. I then tried removing one of the strips of moulding, figuring I’d use one side, then replace the other side with new moulding. Ran down to Home Depot, picked up some moulding and some double-sided tape, got it all home, and it didn’t work. 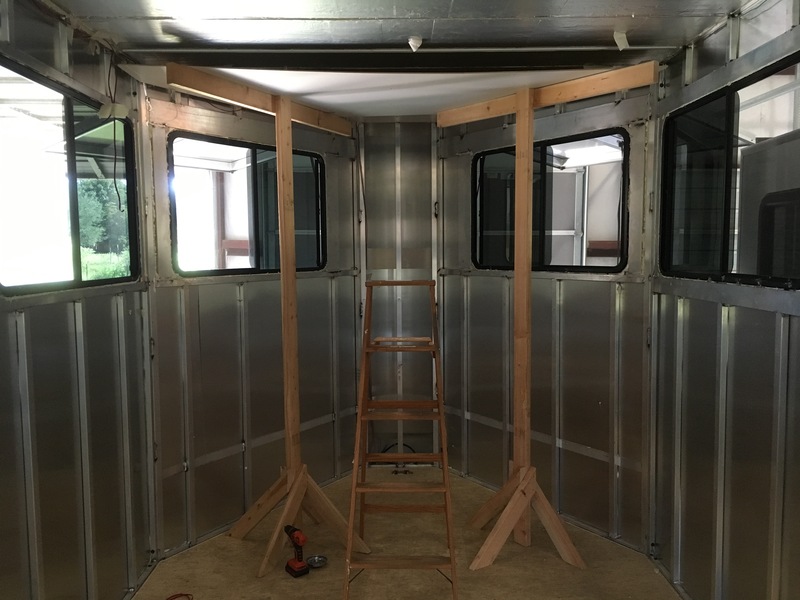 The moulding used in the trailer has a space about 3/8″ thick to fit a board in, the stuff from home depot was less than 1/4″. They look identical, assuming you don’t have them right next to each other. I looked all over and couldn’t find the right size. After much deliberation, I decided to skip the moulding, put the boards up as-is, and deal with the gap between the boards with a new solution at a later point. Once I gave up on trying to make the moulding work, the project started to make progress. I was able to get the panels up. By the time I was down to the last couple panels, I was getting pretty good at it. Drilling out the holes for the lights, lining up the panels, screwing everything into place and wiring the lights, it started going pretty quickly near the end. I wired up the lights in three circuits so I’d have flexibility in lighting options. The first circuit is a single light, placed near the entry. This will light up the internal stair(s) and have a switch placed near the door, low on a cabinet that can be accessed from ground level. One thing that bugs me in my current camper is entering it at night – there’s no light switch anywhere near the door, you have to be completely inside the unit before you can find something to turn on. The trailer won’t have that issue. The next series of lights is for the kitchen/bathroom area. The lights are places essentially over where the countertops will be, plus a light over where the shower will be. The last series of lights is over the loft. 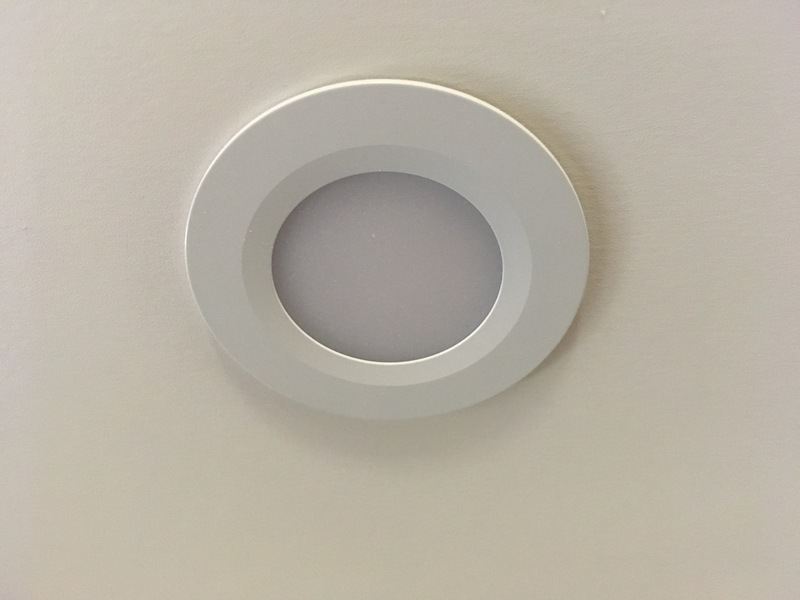 Both of these series of lights will have dimmers to allow for very low light levels when desired. I now have approximately R20 insulation in the ceiling (3″ of Poly-Iso), ten 3-watt LED lights, and all of the ceiling panels put back in place. It’s really nice to have the ceiling in a nearly-finished, totally workable state. It was a real joy to see the lights come on (first try! 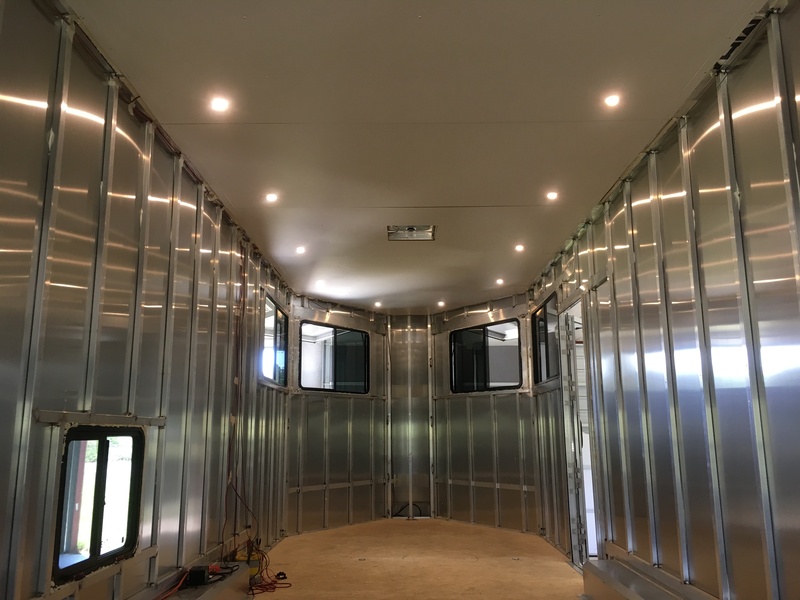 ), and having the lights in place will help illuminate every other project I do in the rest of the trailer until its completion. I like your custom solution for the entrance lighting. Looking very sparkly at the moment with the metal walls gleaming. Next Next post: 52 Gallon Holding Tanks!